Jake's Open House Halloween Party will be held Sunday, Oct. 18, at the Miller-Ward Alumni House, featuring fun activities for alumni, faculty, staff and their families. Costumes are encouraged. Mix with mummies, take a walk in the cemetery, or examine "Zombethics" — the ethical questions invoked by the undead — as Emory celebrates Halloween. Activities begin Sunday, Oct. 18, and are scheduled all the way to the big, scary day. • Jake's Open House Halloween Party will be held Sunday, Oct. 18, from 2 to 4 p.m. at the Miller-Ward Alumni House on Houston Mill Road. 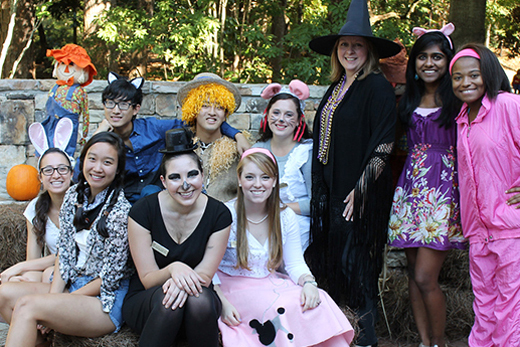 This annual event from the Emory Alumni Association features an afternoon of family-friendly activities at the Miller-Ward Alumni House including arts and crafts, carnival games, a bounce house, picture booth, treats and prizes for faculty, staff and alumni and their families. Costumes are encouraged. A food truck from Willy's Mexicana Grill will be onsite for guests to purchase food at $8 for adults and $5 for kids, which includes an entree, chips and a drink. While admission is free, pre-registration is requested. Contact Missy Rodil at 404-712-8995. • DUCtoberfest, the annual fall event celebrating the Dobbs University Center, will be Friday, Oct. 23, from noon to 3 p.m. in Asbury Circle. This year's theme is Retro DUCtoberfest, sponsored by VarageSale.com. It includes classic arcade games, food, collectibles, photos with the "Back to the Future" DeLorean, and the DUCtoberfest T-shirt.